To stand the physical stress of the tracks, every racer needs to have a good physical conditioning. He practices, daily, two hours of exercises aeróbicos and weight-training. When it is in Sao Paulo, it usually runs 10 kilometers in the Ibirapuera Park, less then 200 meters of the academy where he practice. Between the appliances that he uses, there is a simulator of direction developed in partnership with the Ferrari. 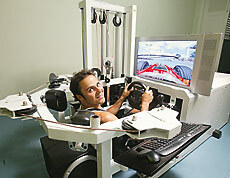 The necessary strength to spin the steering wheel is similar to that of the Formula 1.